When it comes to choosing an office cleaner in Singapore, offices tend to explore three options: (1) Employing freelancers or (2) employing cleaners on payroll or (3) engaging in a cleaning company. It is natural, for many businesses to minimise their service expenses. But as we have shared in a previous article, a tidy and clean office can lead to a healthier, happier and more productive work environments. As humans, we tend to favour saving costs that are obvious and easy to measure versus benefits that are indirect and not immediately felt – in other words, we are wired to overemphasise the short term instead of the long term. So it is a common mistake to compromise on the cost and quality of your daily cleaning. 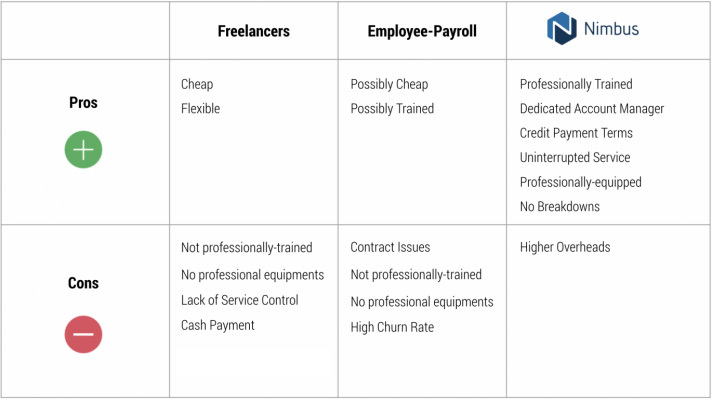 Comparison between freelance cleaners and the various options for service buyers. As a result, many companies tend to employ unlicensed cleaning businesses to do the part-time cleaning for them for anywhere between $14-$18 an hour. However, we strongly advise against this. Firstly, the National Environmental Agency (NEA) recommends Service buyers to ensure they are engaging a cleaning provider (individual or company) with a valid license. Service buyers found engaging in unlicensed cleaning businesses is liable to a fine of $10,000 or $1000 every day for continuing offences. It is possible to directly employ cleaners on payroll. While this could potentially achieve cost-savings, it also means the office or facilities manager typically will have to deal with any absenteeism or the churn rate of any service workers they employ. It often causes high search costs and time-wasting. In considering to operate a micro ‘cleaning company’ within your primary business, office managers will have to consider how ‘core’ this service is to your business. Often this is not the case. Furthermore, if the office manager is not trained in service maintenance or janitorial work, it often leads to inadequate training and equipment, leading to the risk of property damages. This option also neglects the cost of paying your own cleaner employee their CPF or the purchasing of equipment or the possibility of the cleaner quitting on your company midway through the year. A professional cleaning company like Nimbus overcomes many of the concerns stated above as well as bringing with it a trained and motivated workforce. As David Ogilvy once said “Every client gets what they deserve. … A bargain never really is one; you get what you pay for.” Cheap work will cost more in the long run. Spend a little bit more on a good maintenance company, however, and you will get back a disproportionate amount of return on your investment – stress-free office management, happy employees, and a beautiful workspace. A contract offers protection to both provider and the client. It specifies what terms of the agreement are included, what is in the service and how much it would cost each month. At Nimbus, we offer our clients a flexible subscription agreement that includes a service guarantee. If you are unhappy with your contract after two months, we will provide the next 8-hour spring cleaning free of charge. Our termination date is also within 30 days to ensure our clients are not ‘locked-in’ into a yearly contract. Our commitment to a Service Guarantee reflects how confident we are in our service. Finally, you can gauge the professionalism of a cleaning company by how thorough they are with the details. At Nimbus, we use colour coding for our towels ad to separate our towels, mops and pails. For example, we use red cloth only to clean the toilets and blue mops for cleaning of the general area. Doing this avoids cross-contamination because the toilet and pantry area is full of bacteria and you wouldn’t want germs spread to your desks and chairs!